Even morons won’t describe Buhari’s mediocre performance as superlative – Obasanjo – Royal Times of Nigeria. Ex-President Obasanjo on Wednesday, declared that even morons would not describe the mediocre performance of President Buhari as superlative. He made the declaration distancing himself from a purported report trending on the social media that he had made a U-turn on his verdict of non-performance and had declared support for President Buhari. He dissociated himself from the report in a statement by his media aide, Kehinde Akinyemi, in Abeokuta, Ogun State. The statement read in part, “For the record, Obasanjo has not and cannot endorse failure. His position remains as stated in his January 23, 2018 statement on the state of the nation. 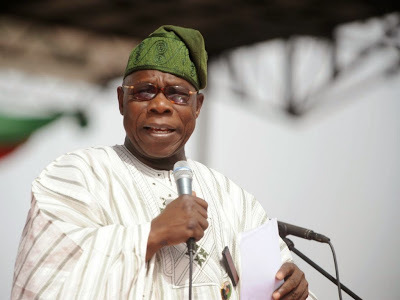 Chief Obasanjo sympathises with the plight of the campaigners and supporters of Buhari. One, the US will continue to reduce purchase of crude oil from Nigeria and there is nothing Nigeria under Buhari can do about it. Two, the US will export agricultural products to Nigeria and Buhari’s government will encourage that; and three, all the killings taking place in Nigeria by herdsmen are being done by expatriates trained by Gadaffi and no Nigerian is to blame and Buhari cannot do anything to stop it. For whatever the meeting was worth, President Buhari again bungled another opportunity to self-redeem. No wonder President Trump ordered him in a rather condescending manner to go back home and stop the killings going on in Nigeria!.